God promised king David (2 Samuel 7:11-16) that God would establish for David a ‘house’ (a lineage, a family, a clan or tribe) that would endure forever! In the context of the books of the Kings where king after king was overthrown some within days of their appointment as king, with whole lines of families being wiped out by successive kings more than once in Israel with the constant threat of invasion and capture from powerful nations all around – in that context these are massive promises to David. And so here at the end of 1&2 Kings in the midst of lament and the tragedy of the siege and sacking and the exile to Babylon, there are four verses that offer a ray of hope, a glimmer of God’s eternal promise to David – which still stands. Jehoiachin and the royal family are deported and not killed by king Nebuchadnezzar of Babylon (2 Kings 24:15) and then after 37yrs in prison in exile king Jehoiachin (also called Jeconiah in the NT) is released from prison by Nebuchadnezzar’s successor and is given a place of honour and provision for his family! 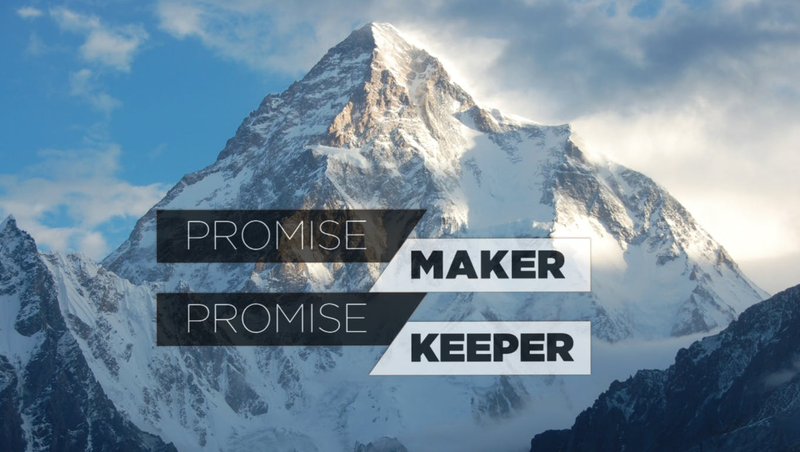 God is faithful, God is the promise keeper, not one of God’s promises fall to the ground. And so the line of David is preserved, the promise still stands, and in Matthew 1:12 we read of Jehoiachin/Jeconiah’s place in the storyline that all culminates in Jesus the King of kings the one who ultimately fulfills the promise made by God to David, and He is enthroned as King forever and ever. Worship, Jesus! Thank God for His unshakable faithfulness. Trust Him. This entry was posted in Assurance, Awe, faith, Faithfulness, Gospel, Jesus, Trust, Worship and tagged #Promisekeeper. A story which started way back when God’s people had clamoured for a human king as recorded in 1 Samuel 8, they wanted to be like the nations around them rather than be lead by God as their king leading them through his appointed prophets/judges. God had warned them that this rejection of Him would not be a blessing to the people and 1&2 Kings records that it definitely wasn’t a blessing! In 2 Kings 24-25 we read of the final sacking of Jerusalem and the exile to Babylon of Judah, approximately 120years after the Assyrians overthrow and exile of Israel. 2 Kings 24:2-4 expressly makes God the active agent as Chaldeans, Moabites, Syrians and Ammonites and finally the Babylonians raid Judah and finally overthrow it with a siege and burn the city and the temple and break the walls down. The Promised Land is vacated by all except a remnant of poor people, the Temple as the place of worship is ruined and ceases to operate. What will happen next? What has happened to the covenant? God’s place – the Promised Land and the Temple lies in ruins, God’s people have been exiled from it. Israel’s history is littered with priests who failed, prophets who failed & kings who failed. The people have been unfaithful to the covenants they made and to God’s word to them. This is the riddle of the Old Testament really. God is holy, we are not – what can we do, what will He do? God’s people, we need a better, a perfect, an eternal prophet, priest & king. All this points to the ONE who was to come – Jesus! Our Saviour, our perfect Prophet, Priest & King! This entry was posted in Gospel, Jesus, Sin and tagged #riddleoftheoldtestament. Hezekiah was a mighty man of God, yet sadly his son Manasseh did not follow his father’s example. Even worse than that Manasseh actually undid all the good his father had done and re-erected altars to Baal and Asherah, he even had altars to these false gods erected inside the Temple! He burned his own son as an offering and consulted fortune-tellers and mediums provoking the Lord to anger. How does this happen? Father follows God incredibly, and yet his son is evil personified. Sadly, the bible has a number of this sort of one-generational God-following. In Deuteronomy Scripture clearly portrays God’s plan for parent to teach God’s ways to their children, to ensure that God-following, that faith is not one-generational but is passed on. But when Josiah heard the words of the Book of the Law he tore his clothes, humbled himself and repented. And because of this God forgave him and granted him mercy (2 Kings 22:18-20). We then read in 2 Kings 23 that Josiah went on to reform all of Judah, leading Judah to renew their covenant with the Lord. Josiah went on to purify the temple of Baal & Asherah worship and removed false priests and broken down the high places and even finally fulfilled the prophecy God brought against Jeroboam back in 1 Kings 13:11-32 and his rebel altar at Bethel. Hezekiah didn’t pass on faith to Manasseh, faith was lost for essentially 75yrs in Judah and then sadly Josiah although he followed God was another example of one-generational God-following as his son, Jehoahaz turned from the Lord again. If you’re a parent – what can you do today, and do beyond today that can ensure that your God-following is not one-generational too? And if your parent(s) have not followed God, can you believe God that you could be like Josiah and break with the past and follow God wholeheartedly and be used by God to accomplish amazing things? This entry was posted in Christian life, Faithfulness, Parenting, Transformation. Hezekiah stands out in stark contrast to the many who went before and those who came after him the rest of verse 5 tells us. And what was the secret to this glowing description of Hezekiah’s life and reign as king of Judah? Hezekiah believed God, and held on to his belief in God unswervingly. He did not get into compromise and sin but kept God’s commandments and in response to his faith and obedience God was with him always and caused him to prosper. Don’t for a moment think that Hezekiah had an easy time following God. Hezekiah didn’t follow God or lead Judah in a time of ease or peace and security but rather did so in the presence of terrifying threats from the Assyrians! The Assyrians had recently overthrown the northern tribes of Israel and had also overtaken all the towns around Jerusalem which was surrounded. What an inspiration Hezekiah is! Don’t you want to be like him? How can you be? Let’s be like Hezekiah, let’s trust God, let’s hold fast to God when life is messy and confusing, let’s not depart from following God and keeping his commandments. And then let’s see all that God will do in and through us. This entry was posted in Christian life, Pleasing God, Prayer, Trust, Wisdom. After a period of nearly 200yrs since Jeroboam’s succession from Judah, the northern tribes of Israel are eventually conquered by the Assyrians and deported into exile (2 Kings 17:6). Under the direction of the Holy Spirit, the writers of Scripture are very keen to make it plain as to why this happened. This was an event that came about not because of bad military or political strategy (although the passage reveals there were mis-steps made), Scripture attributes the source of the capitulation and capture of Israel by Assyria as being God Himself as the active agent. Yes, God is ‘slow to anger and abounding in love’ (Exodus 34:6) but that does not mean that eventually God will not say; ‘enough!’ God was patient, forbearing with Israel but eventually love for all those sinned against, all those who lost loved ones, love for all those babies sacrificed to false gods looked like God judging sin. God had appealed again and again, urged them to turn from their wickedness – but they refused to with hard stubborn hearts. So what can we learn from this for our lives? May we not ever trust our hearts, which are so prone to lead us astray from serving the living God. May we hold on to His words, will and ways laid out for us in Holy Scripture. May we never tamper with His Word and make our own false gods suitable to our fancies and our modern culture’s preferences. May we repent when and if we have sinned against Him, and may we worship our Holy God with holy reverence and as our loving response to all the love He has poured out to us through the gift of His precious Son, Jesus. This entry was posted in Awe, Christian life, Pleasing God, Repentance, Sin, Wisdom, Worship. Over and over and over again in 1 & 2 Kings there is a type of phrase that repeats itself. It’s a phrase that always describes the life and the rule of one of the kings of Israel (the Northern tribes) in a negative way. It’s a phrase that is repeated not 3 or 4 times but is repeated 15 times in 1 & 2 Kings and three time in 2 Kings 15 alone! And all of this is racing towards our the next chapter 2 Kings 17. God is going to use Assyria to finally punish Israel and to stop forever the successive sinfulness of the northern kings who again and again continued in the sin of their forefather, Jeroboam son of Nebat. What does this mean for you and for me? As a father, as a parent; I am freshly struck by the impact we have on not just our own children but on successive generations. We are modelling life for our children, we can’t turn it off, can’t stop it. The question is what are we modelling? What are we passing down to the next generation and the generations to come? Jeoboam’s sin resulted in a stuck record legacy of ungodliness! In 1&2 Kings there is a contrast of sorts to this legacy and that of King David. I say this because there is another phrase that repeats over many of the kings of Judah in the south where God does not punish because of promises He made to David. Even through King David was not perfect by any stretch of the imagination (he murdered, lied, committed adultery…) the Scripture honours King David as a man who’s heart was devoted to God. So what will be said of me, of my heart of my life rhythm when I die one day? Could it be said, will it be said that I was a wholehearted worshipper of God? No one who knew me would ever be able to say; ‘he didn’t sin, make mistakes…’ but could they say – ‘He loved God and served God all his life’? We pass on a legacy! What legacy do you want to pass on? This entry was posted in Christian life, Pleasing God, Wisdom. God will give them victory over their neighbours who have frequently tormented them, they will destroy them entirely – the constant threat will be gone. Up to this point Joash has done everything Elisha told him to do. You would conclude that he has been obedient. But then the story takes a strange quirky twist. Joash obeys the final instruction which does not specify how many times but also doesn’t indicate to stop or do it a short while. Elisha is angry with Joash and tells him that he should have been more enthusiastic essentially and so now because he wasn’t he will not accomplish all that God had planned for him. When I come to passages like this that seem quirky I tend to ask God; Why is this recorded in Your Book? What do you want me to see, hear, understand from it? I often tell people that quick obedience to God’s promptings is a sign of maturity, but maybe this passage adds another factor – enthusiasm. Without making more of it than one should, this passage does seem to indicate that there is more than one type of obedience. Slow obedience and quick obedience and in addition to that there seems to be such a thing as enthusiastic faith-filled obedience and reluctant faith-deprived obedience. May I, may we be those who live out quick obedience that is faith-filled and therefore enthusiastic! This entry was posted in Christian life, faith, Life is a response, Trust and tagged #quickobedience #enthusiasticobedience.